What if paradise existed a mere 180 miles off the coast of the US mainland? 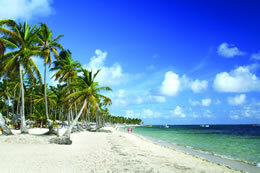 Beautiful sun drenched islands, soft powdery sand beaches, with palm trees swaying in the breeze. What if you could book a cruise for as little as three nights, longer if you can get away, that would whisk you away to this nirvana? Well you can! Cruising to the Bahamas is just that! The perfect getaway! The Bahamas are a group of about 700 islands (okay, some no more than small private cays) not far off the coast of Southern Florida. In 1492 Christopher Columbus first made landfall here…I'm surprised he ever left! The people are warm and friendly and British influence on the island is easy to detect. As a matter of fact, Bahamian English is a funny combination of the Queen’s English, African influence and island slang! The beat of Goombay reverberates the islands and you can’t help but get caught up in its danceable music full of stories and tales. You’ll find historic charm, modern attractions, and ecological wonders waiting for you to experience. Nassau, Paradise Island, and Grand Bahamas Island (Freeport) are the most common ports of call. Nassau, located on the island of New Providence, is the capital and probably the most urbane of all the islands, but I use that term loosely. Upon arrival it’s so tempting to head for hammock on the beach, and there will be time for that, but there’s lots to do here too! Begin by strolling through the city where picturesque, pastel pink Colonial style government buildings erected in the 1800’s still stand. If you’re energetic climb the Queen’s Staircase, also known as the 66 Steps, which leads up to Fort Fincastle. The castle was built in 1796 and the views from the top are well worth the climb. Further downtown, children will enjoy running around Fort Charlotte, complete with moat, open battlements and a dungeon! Nassau is also home of the famous Straw Market, a shopper’s Nirvana! Here you can find a plethora of faux designer handbags, shot glasses, t-shirts, beaded jewelry, and all kinds of kitschy tourist souvenirs. Look a bit harder and you can find wonderful baskets, bags and dolls made from dried palm and sisal plant leaves. There are extraordinarily talented woodcarvers that sell their creations as well; masks, animals, figurines, and statues All in all, the market should not be missed. For more upscale shopping visit Bay Street. This is where you can purchase, duty-free I may add, perfume, jewelry and fine English bone china. Traveling east on Bay Street takes you to the bridge leading to Paradise Island. If you don’t want to walk in the heat you can take a cab or water taxi. The reason people venture over is because it’s the home of the Atlantis Resort. This mega compound offers so much! There is the beach of course, but people come here from the ship in droves to experience the jaw-dropping water slides, pools, lazy river, and marine life exhibit. Most cruise lines sell day passes to the resort and you cannot get in without one. 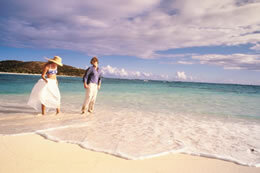 Freeport is on Grand Bahamas Island and was specifically designed for tourists. As a result you can expect to find lots of great duty-free shopping. Downtown is the International Bazaar, divided into sections representing different parts of the world. There are also some really good restaurants in this area. If shopping is not on your “to do” list then you should know that there are two national parks on Grand Bahamas Island. Petersons Cay is a small islet with an unspoiled reef and a small sand beach. The second, Lucayan National Park, features a wide variety of mini eco-systems and just may be the nicest beach in the island. Relax on hammocks or explore caves and blue holes. The Bahamas National Trust maintains the parks. Who knew you could make it to paradise and back in under a week! Well, now the secret is out. 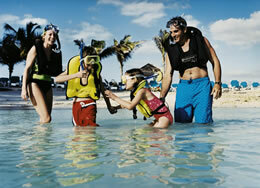 All of the islands of the Bahamas offer an abundance of water related activities. Sailing, swimming with dolphins, snorkeling, diving, jet skiing, fishing, kayaking…it’s all here and a whole lot more! Cruising to the Bahamas is your perfect escape! Paradise is within reach on a Bahamas cruise. Starting from many cities along the East Coast of the United States, ships depart for a slight but nonetheless memorable diversion into beauty, fun, and relaxation. 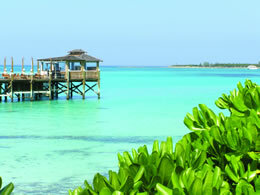 Just 180 miles off the coast of Florida, the Bahamas consists of 700 islands. 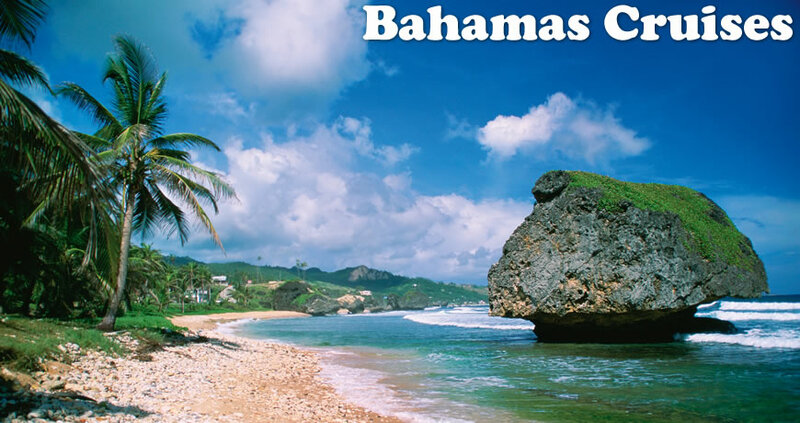 Cruise itineraries typically include Freeport and capital city Nassau, with longer excursions offering a breathtaking view of the country'ss natural features and more time for taking in its white, soft sands. Cruises to the Bahamas last anywhere from two to seven days, and for many on the East Coast, are a perfect getaway opportunity. In fact, a cruise port, with a ship departing to this island oasis, may be within driving distance. Trips leave all year round from Baltimore, Bayonne, Charleston, Ft. Lauderdale, Jacksonville, Miami, New York, Norfolk, and Pt. Canaveral. Convenience constitutes just one portion of a Bahamas cruise, and aside from the attractions, the ship'ss activities define the journey. Depending upon whether luxury, great nightlife, or a family-friendly environment is your goal, several Carnival, Celebrity, Norwegian, Bahamas, and Royal Caribbean cruise lines depart for the Bahamas. Read about each cruise line'ss defining features through Direct Line Cruises and find great package deals for your vacation! • Nassau. The country'ss capital city is located on the island of New Providence. Colonial-style architecture, nearly unchanged from the 1800s, greets you upon entering this city. Nassau further serves as the passageway for several activities: Fort Fincastle, after climbing up the 66 Steps, for a great view, and Straw Market and Bay Street for shopping and delicious cuisine. • Paradise Island. Not far from Nassau, Paradise Island is home to Atlantis Resort – a beach with unsurpassed watersides, pools, and a view of marine life. Many cruise ships offer day passes to this popular attraction. • Freeport. On the Grand Bahamas Island, Freeport is a duty-free shopping destination. Within distinct sections, the International Bazaar encapsulates cultures from around the world, with both food and wares. • Grand Bahamas Island. Beyond Freeport, Grand Bahamas Island offers two National Parks that provide a detour into the natural, untouched attractions of this Caribbean paradise. Petersons Cay features a reef in pristine condition, while Lucayan National Park presents several mini eco-systems and some of the country'ss best beaches.